Algonquins and their supporters arrested for demanding Minister Cannon respect their leadership customs: release of Riel report confirms Conservative Government's illegal meddling in Barriere Lake's internal governance. 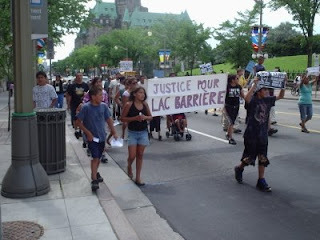 Montreal, QC / – On Thursday June 26, 2008, seven Algonquin youth from Barriere Lake, along with five non-native supporters, peacefully occupied the office of Lawrence Cannon for five hours, demanding that Cannon meet with them and ensure his Conservative Government oversee a leadership reselection in Barriere Lake. Six people were arrested and charged for refusing to leave until the demands were met. "Cannon didn't even have the respect to meet with us," said Barriere Lake spokesperson Michel Thusky, whose daughter was one of those arrested. "As a Cabinet member who is the representative in Barriere Lake's riding, Cannon can ensure our customs are respected. His inaction shows that his Conservative Government's residential school apology was meaningless, as they continue violating our customs." The release of a report written by Laurier Riel, a Maniwaki Court Worker, confirms that the Department of Indian Affairs deliberately violated Barriere Lake's Customary Governance Code in their effort to recognize members of a minority faction as the new leadership. Present at an alleged leadership selection conducted by a minority faction on January 30, 2008, Riel wrote that he could not "guarantee" the Customary Governance Code was respected. information" justifying this unilateral leadership change, but refused to show the report to the Barriere Lake community. After two and half months of stonewalling, the Riel report was released to the legal counsel for Barriere Lake's Elder's Council, who are challenging the leadership change in federal court. Contradicting the federal government's claim that they ensured Barriere Lake's customary leadership selection was followed, Riel writes in his report that "my statement" that "to the best of my knowledge [the leadership selection] was in accordance with the Mitchikanibikok Anishnabe Onakinakewin [Customary Governance Code] could cause confusion." He can "not guarantee that all the other rules on leadership revision were observed," describing how Elder's Council member Harry Wawatie as well as the ousted Customary Chief Benjamin Nottaway and his Council were not present at the leadership selection, in violation of Barriere Lake's Customary Governance Code. Riel also writes that he cannot "guarantee" that proper notice had been given to the Barriere Lake Elder's Council or to eligible members of the Barriere Lake community. Grand Chief Norman Young, of the Algonquin Nation Secretariat (ANS), the Tribal Council representing the Algonquin First Nations of Barriere Lake, Wolf Lake, and Temiskaming, recently issued a letter to Indian Affairs Minister Chuck Strahl, encouraging him to support a leadership reselection process in the community. The Algonquin Nation Secretariat continues to recognize and work with deposed Chief Nottaway and his Council.